You want to skydive Grafton? It’s only approximately 1 hours journey from Grafton to Coffs Harbour which gives you the opportunity to jump out of a plane and land on the beach. You can skydive from 15,000ft, the highest beach skydive in Australia, which we highly recommend, and if you look on Trip Advisor or Facebook you’ll see we’re not the only ones. 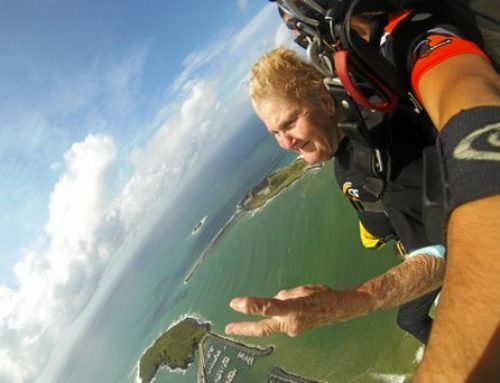 Coffs Skydivers has a long standing relationship with Grafton. We’ve landed in Grafton for many different events over the years. Some of the memorable ones are landing for the Dragon Boat races which is during the Jacaranda Festival, that was about 6 years ago. Four years ago we Skydived onto Susan Island in Grafton and it was the 80th birthday for a long time Grafton resident, Greg Ryan. 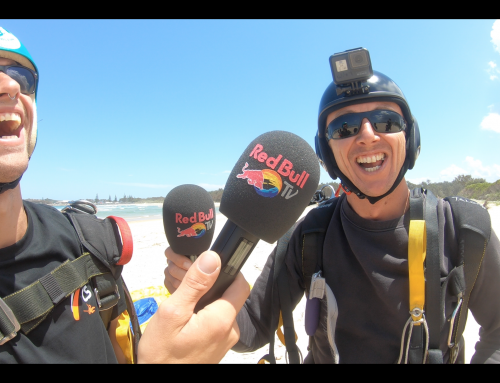 Greg’s dream was to Skydive onto Susan Island so we set that up with the council and the SES. We came in and landed 2 tandem skydives on the beach end of Susan Island which as far as we know is the only time that’s ever been done in Grafton. When we’re skydiving in Grafton by the time we get above 4,000ft we can see the coast, we can see the coastline and we can see the Clarence River exiting near Yamba. We were involved in the “Jump For Kyle Clifford” memorial days in memory of a young Grafton resident who died in a car crash. The jump days were to raise awareness around drink driving and celebrate his zest for life. 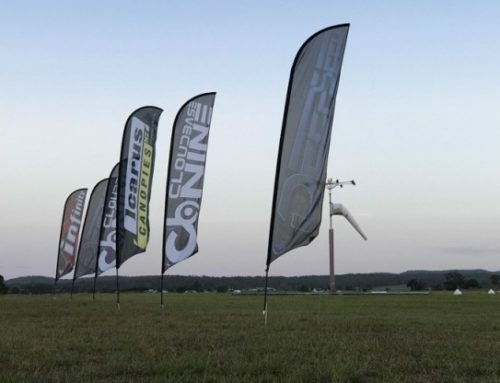 They ran annually for 3 years with up to 47 people skydiving in one day! Also, if you look at the pictures with this article, there’s a local football team in Grafton called the Rhino’s. Coffs Skydivers landed at the football ground for the Rhino’s footy team. 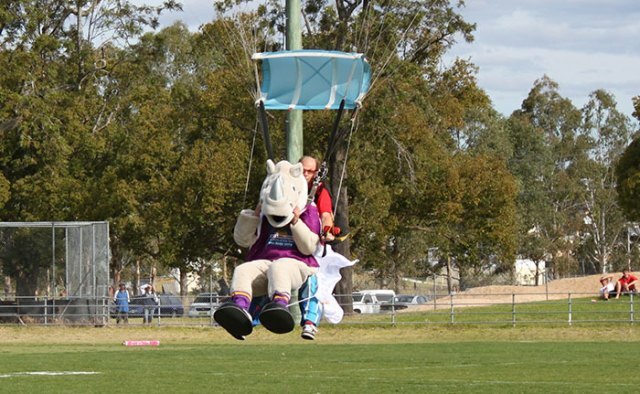 We had the mascot so Pom flew a tandem with one of the Coffs Skydivers instructors dressed in the rhinoceros costume. We landed at the football match, right in the middle of the stadium just before their grand final, which was also fabulous. When we’re skydiving in Grafton by the time we get above 4,000ft we can see the coast, we can see the coastline and we can see the Clarence River exiting near Yamba. In Coffs Harbour, obviously as soon as we take off we’re flying straight over the beach and we are looking down on the Solitary Islands Marine Reserve and the Great Dividing Range is directly behind. 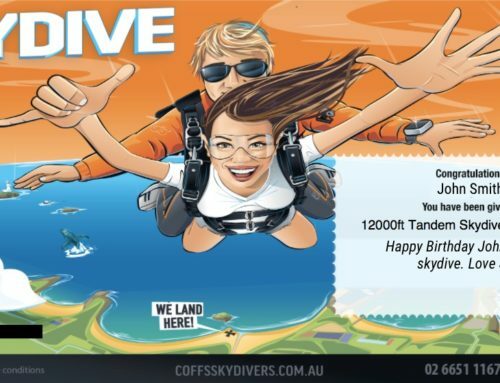 Coffs Harbour is one of the places where the dividing range is closest to the coast, hence we have our main skydiving operation located there. Well I really hope that you make the choice to come and skydive with us in Coffs Harbour or if you have some special event in mind, please let us know and we’ll see if we can come up to Skydive Grafton with you! If you want to make the short trip to Coffs Harbour for a Beach Skydive, you can book online or get in touch via our contact page.